Iran Launches GOP Debate Rhetoric To Flights Of Fancy : It's All Politics If the U.S. continues to be the Great Satan in eyes of many Iranian officials, capable of inspiring over-the-top rhetoric in Teheran, Iran appears to have a similar affect on U.S. politicians, propelling them to flights of excess. 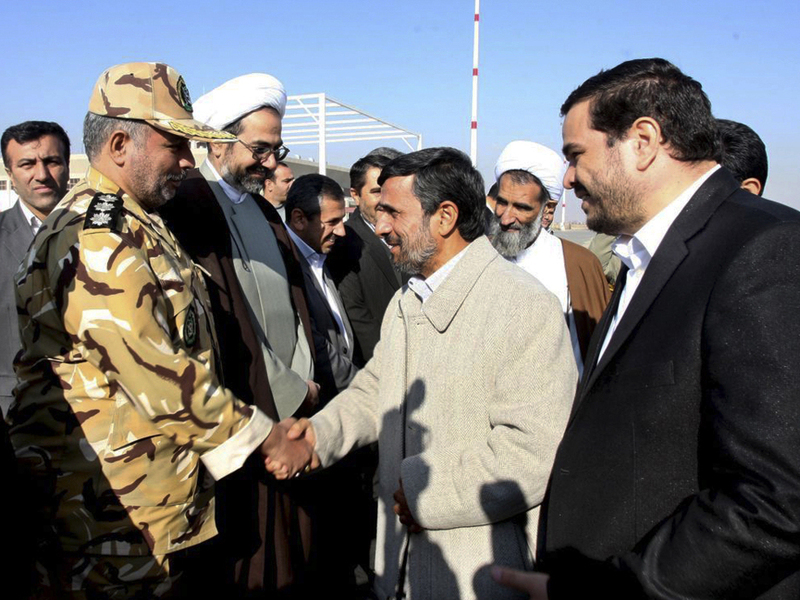 Iranian President Mahmoud Ahmadinejad shakes hands with an unidentified army colonel in Shahr-e-Kord, Iran, Nov. 9, 2011. If the U.S. continues to be the Great Satan in eyes of many Iranian officials, capable of inspiring over-the-top rhetoric in Teheran, Iran appears to have a similar effect on many U.S. politicians, propelling some to flights of excess. BACHMANN: "They've stated, as recently as August just before President Ahmadinejad came to — to the U.N. General Assembly. He said that he wanted to eradicate Israel from the face of the earth. He has said that if he has a nuclear weapon he will use it to wipe Israel off the face of the earth. He will use it against the United States of America." Unfortunately for Bachmann's expanding reputation for getting facts wrong, this isn't true. As NPR's Tom Gjelten, who covers national-security issues for the network, told Linda Wertheimer on Morning Edition, Ahmadinejad has said no such thing, at least not publicly that we know of. "And Linda, that statement is just plain incorrect. Mahmoud Ahmadinejad, the Iranian president, has never said he would use a nuclear weapon against Israel or against the United States. In fact, Iran has said over and over and over again that they have no intention of getting a nuclear weapon. They may well be lying but that is what they said." Texas Gov. Rick Perry called for sanctions on the Iranian central bank. PERRY: "That would be one of the most powerful ways to impact that. As a matter of fact, Congressman Paul, that is what we need to do before we ever start having any conversations about a military strike, is to use every sanction that we have. And when you sanction the Iranian Central Bank, that will shut down that economy. At that particular point in time, they truly have to deal with the United States." Given how Perry infamously went after U.S. Federal Reserve chairman Ben Bernanke, it's not surprising that crippling the Iranian central bank might have a certain appeal for the Texas governor. But as Tom pointed out, such a move could make it impossible for Iran to supply world markets with oil. TOM: "A whole lot of oil would therefore come off the market. The price of oil would skyrocket. That's why the U.S. administration has not moved on that. There is a lot of opposition to it for that reason." Iran provides nearly five percent of the world's oil production. The last thing many of the world's larger national economies, not to mention the smaller ones, need right now would be sharply higher oil prices. With Eurozone economies endangered by fiscal troubles in several countries, including Italy, and the U.S. experiencing a weak recovery, higher oil prices could trigger another global recession. Newt Gingrich, leader of the GOP presidential field, according to several national polls, raised many eyebrows when he talked of the U.S. not only being capable of changing the Iranian regime but of being able to do it within a year. ... But if we were serious, we could break the Iranian regime, I think, within a year, starting candidly with cutting off the gasoline supply to Iran, and then, frankly, sabotaging the only refinery they have. GINGRICH: I think it's a good idea if you're serious about stopping them having nuclear — I mean, I think replacing the regime before they get a nuclear weapon without a war beats replacing the regime with war, which beats allowing them to have a nuclear weapon. Those are your three choices. That the U.S. hasn't had the best track record when it comes to regime change or that it has generally seen a litany of unintended consequences when it has tried it wasn't discussed. Indeed, Iran itself was one such example of the pitfalls of regime change. We can trace present day Iran back to the British and CIA-inspired coup of Iran's Mohammed Mossadegh regime in 1953. Also left unsaid was the fact that the Iran-U.S. contest is not a one-way street. Iran has the ability to push U.S. pressure points. It could exert more influence over Iraq or cause instability elsewhere in the Middle East.